According to Peter Drucker, Leadership is “doing the right thing” and Management is “doing the thing right”. In other words, leadership would choose destination and the right road while management would be responsible to drive on that road speedily with safety. However, there is a degree of overlap between these two functions in real life. A leader can’t say that he will not get into details and keep motivating his team throughout, while a manager can’t say that he will not use his imagination whenever required. The duality of roles calls for using brain faculties in tandem. We all would like to use the whole brain gifted to us by God Almighty to become successful scientists, leaders and CEO’s. According to psychologists, human brain has two parts. 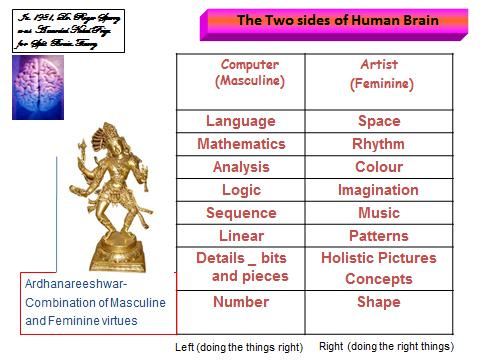 Left side is known as masculine side working like a computer whereas Right side is known as feminine side working like an artist. The left side understands language, mathematics, analysis, logic sequence, linear, details-bits and pieces, numbers. The right side understands space, rhythm, colour, imagination, music, patterns, holistic pictures, concepts, shape. In 1981, Neurosurgeon Dr. Roger Sperry was awarded Nobel Prize for split brain theory medically corroborating the above hypothesis. Having known the above, every human being, a male or a female, needs to develop both sides of his/her brain to become a complete personality-A leader with an eye on details. Take for example Albert Einstein who used to travel on sunbeams, who conceived time as 4th dimension and propounded the theory of relativity, equally good at mathematics was a music lover. Abdul Kalam is a man of missiles, who organized DRDO, conceptualized India Vision-2020 and he loves to play on Veena. In India thousands of years ago, our Rishi’s and Yogi’s were aware of the supremacy of combination of masculine and feminine virtues and were building the temples of “Ardhanareeshwar” to symbolize the same. A common person unfortunately has a tendency to be Left-hander. People use left hand side of the brain most of the time ignoring the power of right click. I noticed this when I was Chief, Planning of a Central Public Sector-NHPC. I had only two computers in my Division. We used them exclusively for “Data Bank” (for things like Annual plans, Budget etc.) and “Concept Bank” (for concepts like sustainable development, Hydro environment interface, Integrated river basin planning). “B.Tech.+ MBA” against B.Tech’s. Their argument was that mere B.Tech’s don’t fit into their requirements. Though they can take care of O&M and safety of electrical equipment’s under their charge in a Sub-station/Feeder/District/Circle; they fail to manage the Unit as a Business Entity responsible for ensuring revenue ‘Y’ commensurate with energy ‘X’ received by them in their system with minimum losses. What needs to be done is to spur the right brain out of its inertness. Activation of right brain is possible by constantly practicing imagination, envisioning, and philosophizing whatever we observe. For instance, rubber band is a small ring. When stretched it can hold volumes of books. Similarly when one stretches his nerves, hidden potential expands beyond imagination. A battery appears to be a small object with a small invisible charge within, but when removed from the control panel, it stops a giant machine. Similarly the entire workforce comes to a standstill when an invisible motivation becomes absent. A seed appears tiny but contains a tree within. By meditating on such invisibles our right brain will start functioning hand in hand with left brain ensuring higher PLF of our brain which will become a powerhouse of great energy capable of enlightening every one around.